Kirkina 'Mucko' or 'Mukko' was born in the late 19th century near Rigolet, Labrador. Her life took a trajectory that no one could have predicted following an early trauma in which she lost both legs. It was during a winter storm when she was just two years old that the dramatic event took place. Kirkina's mother was seriously ill (or was about to give birth, as some accounts go) and her father, who worked as a trapper, set out for Rigolet to seek help. The weather was bad and his journey took longer than expected. It is unclear whether he reached Rigolet or not, but he returned alone to find Kirkina in grave danger. Her legs had frozen and turned black with gangrene which, if it continued to spread, would quickly kill the small child. So, in a crude but miraculous medical act, her father amputated both legs below the knee using an axe. In some accounts he stopped the bleeding by propping her up in a barrel of flour, while in others he used a salve made of tree bark. The details of this event continue to vary. It has been written that Kirkina's mother and newborn sibling did not survive through the winter storm, and elsewhere that they survived and went on to live a full life. In some reports there is no baby at all. "In the other hut, I met the girl Kirkina, whose father had to cut off her frozen feet with an axe to save her from gangrene. It is one of Dr. Grenfell's stories and always makes his audience shudder." 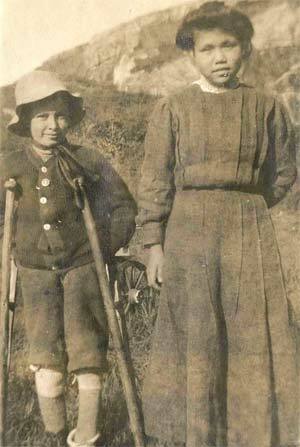 Kirkina was fitted with prosthetic limbs and accompanied Dr. Grenfell to St. Anthony, although some accounts suggest she went with him on his lecture circuits to both New York and Mexico. She eventually returned to Labrador, married, and together the couple had seven children. This is not, however, where Kirkina's story ends. Rigolet was to suffer an influenza epidemic in 1918 during which all but one of Kirkina's children died along with her husband. Like many widows in Newfoundland and Labrador Kirkina persevered and went on to study midwifery. She returned to the isolated region where she was born and worked as a midwife for three decades.